For Koreans in their 40s and 50s, Jongno 2-ga is a place rich with memories. During the harsh years of Japanese colonial rule (1910–1945), Jongno 2-ga was the center of Korean commercial activity. The Hwasin Department Store, which stood where the Jongno Tower now stands, was built with Korean capital and designed by a Park Gilryong, the most famous Korean architect of the colonial period. The opening of Subway Line 1 in 1974, combined with a growing economy, helped turn Jongno 2-ga into the center of Korean college student culture. This lasted until the 1990s, when students took an interest in other places such as Hongdae, Sinchon, and Daehangno. The best way to begin to explore Jongno 2-ga is from Exit 4 of Jonggak Station (Line 1). 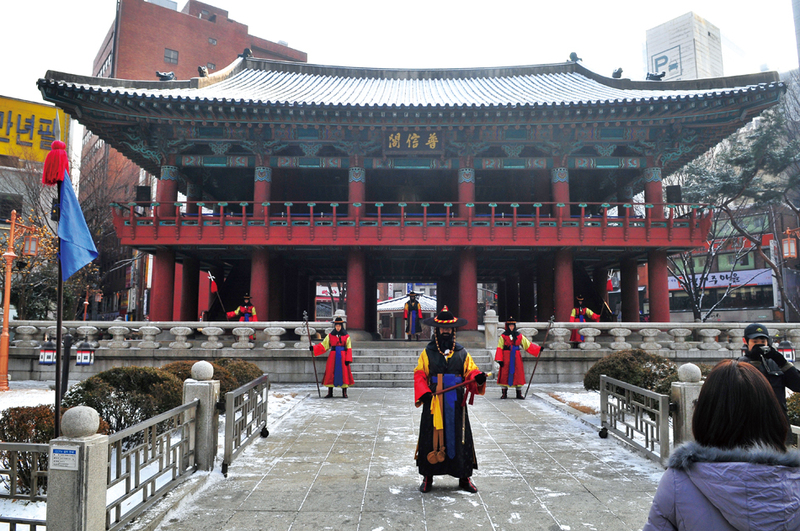 From the exit, look to the right and you will see the Bosingak Belfry, a traditional tile-roofed building that holds the bell that announced the opening and closing of the gates to Seoul during the Joseon Dynasty (1392–1910). The first belfry was built in 1395—when Seoul was designated as the capital—but it has been destroyed and rebuilt over the years. The current structure dates from 1980 and was designed as an authentic replica of the original 1395 building. 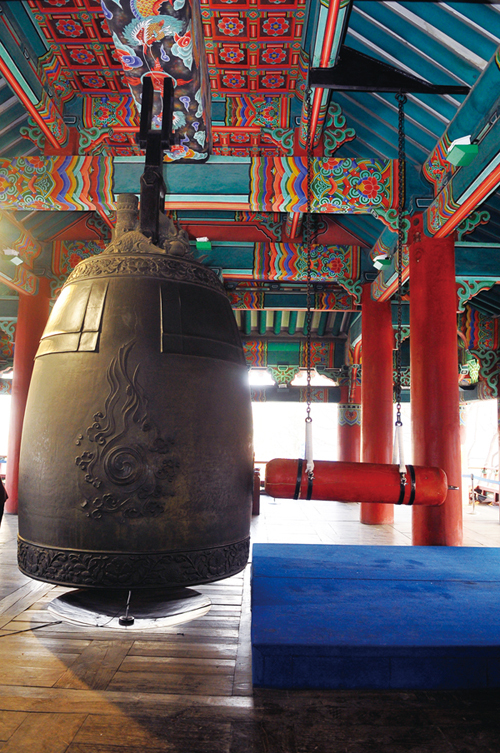 The original bell was cast in 1695 but has been moved to the National Museum of Korea for protection. The current bell was hung in 1985 to mark the 40th anniversary of liberation from Japanese colonial rule. The bell no longer marks the opening and closing of the gates, but of traditional bell ringing ceremonies are held from December 21 to January 2. Across the street from Bosingak is Jongno Tower, an example of 1990s “postmodern” architecture that was the rage in Seoul at the time. The floating top floors contain a sky lounge that offers sweeping views of the center of Seoul and particularly good views of Bukchon, which is famous for its concentration of traditional-style Korean houses. The walk along the main street from Bosingak goes past shops that have changed hands many times. The Chongno Bookstore (Jongno used to be written as “Chongno” in the old Romanization system) was the largest bookstore in Seoul until the Kyobo Book Centre opened in 1981. Generations of college students have been using the bookstore and the wide part of the sidewalk in front of Bosingak as meeting places. 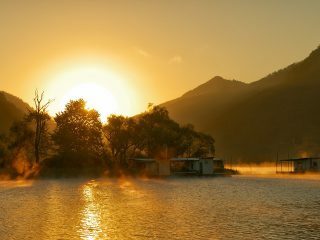 The area near Bosingak used to be famous for hanbok (Korean traditional clothes) shops, but they have gradually disappeared. On the opposite side of the street is the Seoul YMCA. The present building sits on the site of a large brick building that was an important part of the Jongno 2-ga streetscape during the colonial period. Early members of the YMCA were opposed to Japanese colonial rule, and many were active supporters of the March 1st Independence Movement in 1919. The current building dates from 1967 and houses an inexpensive hotel that was a popular place for foreign visitors to Korea in the 1970s and 1980s. After passing the YMCA, take the first right, which will take you into the heart of Jongno 2-ga. The area still has many restaurants, coffee shops, and bars that cater to college students, but it also has something else that Korean college students need: language institutes. The boom in language institutes, most of which center on teaching English, began in Jongno 2-ga and nearby Jongno 3-ga. Most of the most famous institutes, some of which have grown into large corporations, got their start in the area. As you walk through the backstreets, make sure to look at the street stalls that line the wide pedestrian street. From here, return to Jonggak Station or walk toward Jongno 3-ga, where you can enter Insa-dong by turning left at the big intersection.